Following is a list of some of the most popular annual festivals and events in Kananaskis Country and surrounding communities. If you're an event organizer, please contact us to feature your event on this page. This is our annual celebration of summer, held on the 3rd weekend of July. The parade on Saturday morning is the main event, but there are lots of activities for everyone. There’s a market square, face painting, dunk tank, beer gardens, food and concessions, bounce houses, live music and more. Annually in July - Enjoy your weekend full of action packed rodeo at the Redwood Fair Grounds nestled in the beautiful scenery of Tsuu T'ina Nation. During the traditional powwow, First Nations dancers and drummers from across North America compete in dancing and drumming competitions. Everyone is welcome to come out and learn about Tsuu T’ina First Nations culture, history and traditions. Join us at the Annual Canmore Folk Music Festival in Centennial Park featuring three days and three stages of folk/roots, blues and world beat from national and international performers. The alcohol-free event includes a global artisan village, food vendor area and family area, as well as a number of free off-site activities. Held annually on the Labour Day weekend, this event has become one of the signature summer events of Canmore. Our full Highland Games includes a highland dance competition, piping and drumming competition, heavy sports contest, sheep dog demonstrations, massed bands, clan tents, Celtic wares and traditional food and beverages. 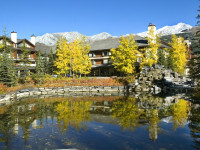 Official Events & Festivals page of Tourism Canmore Kananaskis. Official Events Calendar for Banff National Park. Official Events Calendar of Banff Lake Louise Tourism. Everything you need to know about events in the Banff and Lake Louise areas. Events & Programs page of Alberta Parks for Kananaskis Country.